- Full spectrum of essential vitamins and minerals. Two-Per-Day is our bestselling Multivitamin with extra high dosages of active ingredients. 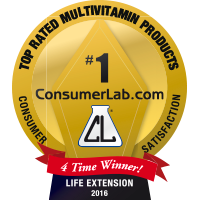 Life Extension's ultra low-cost formula Two-Per-Day provides up to 50 times more potency when compared to conventional products. So, if you are going to take a daily multivitamin supplement (Two-Per-Day), why not take the one with the highest potency?